Dome tent with simple structure. 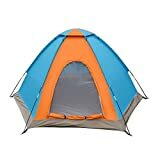 One person first using this tent is able to set up the tent quickly. A large Mesh Tent Door and Mesh Dormer with cloth cover is good for ventilation and effectively prevent the attack of mosquito, suitable for summer, spring and autumn use. Large inner space. Sleeps 6 People. This tent is fantastic for camping, the beach, children play dens and perfect for festivals and events. XFAY Tent is portable tent Durable, Anti-Rain Storm and Anti-Wind and with Good Ventilation. 1,Durable and waterproof cloth material. 2,Crossing glassfibre pole design, through-bar design, increasing the Stability of tent.The tent has four corners with rain cover, door pack belts and fixing strap can effectively resistant the strong wind and rain storm. 3,The inner tent with a large area,the fine gauze tent door design and the dormer cloth cover make the tent Excelent Ventilation suitable in spring, summer and automn. 4,Two-way zipper let us can pull the zipper inside or outside. 5,Lightweight,small pockage bag size, easy to carry. Package bag size: 60 x 10 x 10 cm.